Pictures, images & photos of the colourful Venetian Island of Burano. 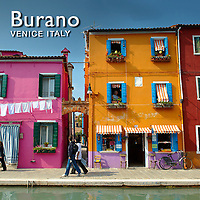 Visitors to Burano can be forgiven for believing that the inhabitants of Burano Island must be colour blind! Every canal on the small Venetian Lagoon island is lined with simple houses painted in bright clashing colours that reflect in a dazzling way in the muddy waters of the canals. There can be few other places where primary colours are used as a house decoration with such abandon. Uncoordinated and garish the effect can only bring a smile to even the most jaded travellers face. The buildings of Burano may be less sophisticated than its neighbouring and better known main Island of Venice, but the sense of joy its little coloured houses create make Burano a must to visit. Unlike St Mark's square it is possible to wonder around Burano in near solitude. The Vaporetto which plies its way to Burano reaches it via Venice cemetery Island and the famous Glass blowing Island of Murano. The trip across the lagoon makes the trip work while in itself but nothing can prepare travellers for Burano.